I don't really consider myself to be that badly affected by multiple sclerosis. The symptoms that I do have are mostly invisible, and to look at me, you wouldn't immediately know that there was anything wrong with me (unless you looked very closely)....but in their own subtle, insidious ways, my symptoms are nibbling away at the things that I used to be able to take entirely for granted. On Sunday, in our longest training run for the marathon yet, we ran 9.48 miles. I'm sure Runkeeper would provide me with the detailed analysis if I could only be bothered to look for it, but I think that's the longest run I have done since late 2012. I ran my half marathon PB in September that same year, but not long after that, I really began to struggle when irritating problems with the plantar fascia of my left foot began to spread up my leg, first into my ITB and then into my left hip. Before long, I was only able to manage a single, pathetic, hobbling 3 miles a week. Depressing. I saw a specialist, hoping to perhaps get another steroid injection into my foot. An injection into the sole of your foot is not a very pleasant experience, for sure, but it did at least kill the symptoms of PF in that foot for nearly a year. The specialist took one look at me and knew better: the PF was a symptom and not the underlying cause and treating the symptom would ultimately not do me any good or solve the problem in the longer term. Apparently, I have about 10% less muscle mass on the left hand side of my body. That might not sound like much, but it's a visible difference. I was measured for a pair of lederhosen trousers the other day -- that's another story -- and the Austrian craftsman was slightly taken aback to find that my left leg measures 1.5cm less around the thigh than my right. In short, my MS seems to mean that I am losing muscle strength on the left hand side of my body faster than I am losing it on the right. This means that, on a long run, I seem to drop the left hand side of my body and adjust my running style accordingly, causing me all sorts of knock-on bio-mechanical issues. To make matters worse, I've lost flexibility in my left ankle too. As I tire, as well as dropping my left leg, I also start to drop my ankle, scuffing me foot as I run.... sometimes to the point of tripping myself up, but enough to cause stress up through my leg and into my knee and hip. Am I going to let it stop me running? Well, perhaps one day I won't have any choice... but until that day, I'm going to keep doing the best I can come hell or high water. I ran more than 800 miles across 2014, although I don't think I ever ran more than seven or eight miles at a time. To be honest, I didn't think my body would be able to tolerate running another half marathon, never mind a full marathon. Ah, hell. You only live once, right? There's only one way to find out. 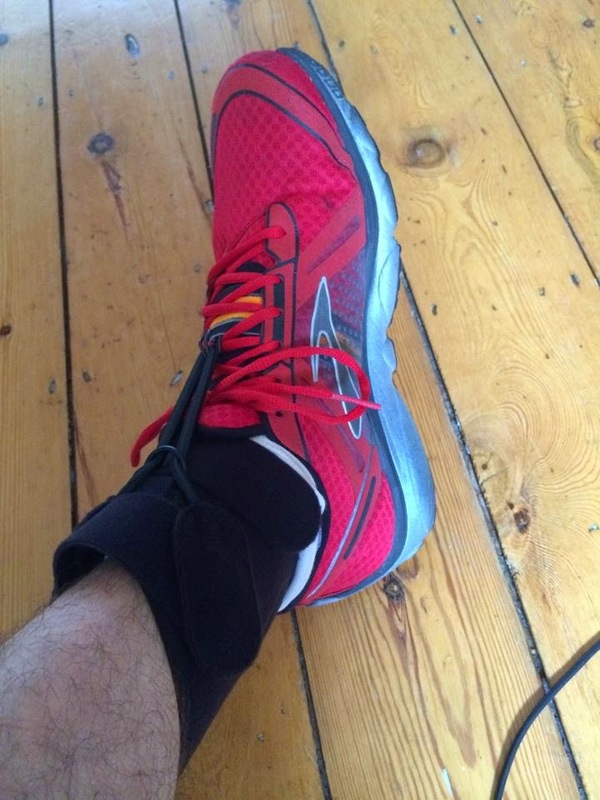 As the distances I run start to increase as we get properly into our marathon training, I'm wearing an ankle cuff on my left foot with an elastic loop designed to stop my foot from dropping and scuffing on the ground. It's not especially comfortable to wear, and over the last few months I've acquired some interesting new scars where it has worn its way into my skin as I run.... but it seems to be succeeding in its primary job of stopping the foot scuff, which is great news. I was fine for the vast majority of Sunday's 9.48 mile run. I started to get some stiffness and discomfort in my left hip after about 8 miles, but nothing serious enough to cause me to stop. Of course, 26.2 miles is still quite a lot further than 9.48 miles, so if I'm sensible, I'll take those little warning twinges as a sign that I should find that rubber band thing the physios gave me in the summer and start doing those exercises in my hip again. Either that or stop entirely..... but as that's not going to happen anytime soon, the mild discomfort and inconvenience of the exercises it is. Our training mileage ramps remorselessly from now onwards. The first couple of weeks of my schedule have actually been easier than my normal weekly training routine. Not for much longer: my midweek run this week is going to be 6-7 miles... a good couple of miles longer than I would normally manager. Last week, Runkeeper told me, I ran the most miles in a single week since I started tracking my runs in 2008. 26 miles. I think my weekly training mileage will peak at around forty miles towards the end of March. Will my body hold up to the strain? Well, there's only one way to find out. After all, I'm not dead yet. You know what? It could be worse. 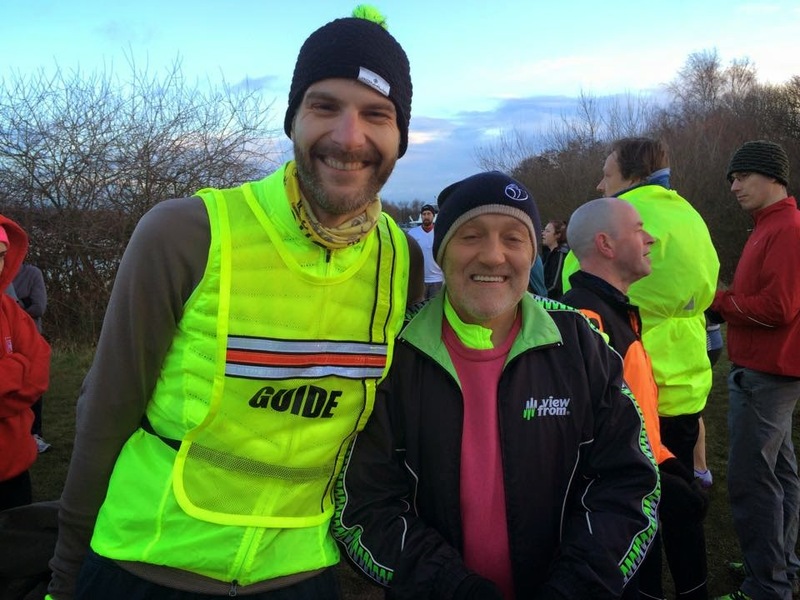 On Saturday this week, I was the guide for a blind runner at Colwick parkrun. It was properly cold and running conditions were icy, but it didn't put Terry off one little bit. At one point, he took a bit of a tumble, but after checking that he was still in one piece, he picked himself up, dusted himself down and completed the run. He's an amazing guy and it was both humbling and inspiring to run with him. If Terry can overcome the loss of his sight and still be running (he's hoping to get his PB down under 24 minutes this year), then what the hell have I got to be complaining about? it's good to get a bit more info on your 'lederhosen' comment - more details required tho! that laggy band-deely looks interesting - i've got an orthotic support stocking which doesn't really do enough - where did you get it? I got that support from the NHS via an orthotist (who also gave me insoles for my running shoes). It was the upshot of a series of NHS physio appointments about my various physical issues and is designed to help stop the "drop" of my left ankle as I tire when running. It is commercially available for about £50, I think and would be happy to forward you the details if you're interested. Seems to help.